Merrily Go Along: Dinner Anyone? You know when you put a lot of thought into your family dinner and you are sure that everyone will be so pleased, but nope, it's just not the case? I sure felt that this evening. As a mother we can all have our emotional moments and this was one of mine. Yes, I am sharing this with you and it is quite alright. You see, I enjoy being in the kitchen. Call it my sanctuary, if you will. But, I have been so happy with my new cookbooks and working on my meal planning. I have it painted in colors I love and it has become my canvas of art that gets daily use out of it. I create in this special room and then create some more. Last night I made nachos for a Mexican inspired dinner and it was a huge hit for the whole family. I only wanted to have another hit this evening, but with an Asian inspired dinner. 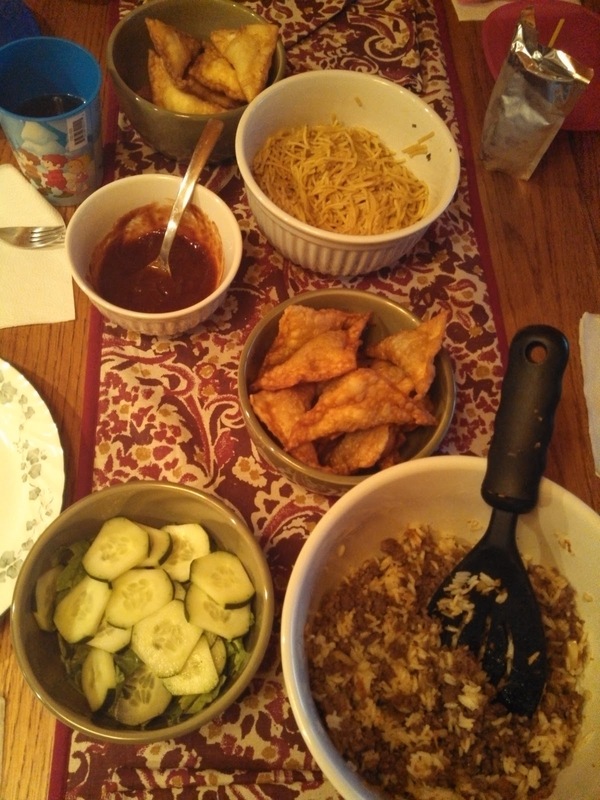 I made cream cheese wonton, beefy wonton, chow mein, veggies and beefy fried rice. My husband Scott, daughter Caylee, as well as myself all enjoyed this feast. My son Caleb and daughter Kylie did not. I immediately became sad and felt that our nice family dinner was not so nice anymore. But, then a thought came into my mind. I really feel it was the Holy Spirit softly whispering to me that everything will be ok, they are kids. Well, this was totally right and put my feelings to ease. Kids are known to be picky eaters. I know that my kids can be picky eaters at times, but it was just the simple fact that I was sure they would love dinner and appreciate all of my preparation for the meal. I am truly grateful for my loving husband who enjoyed the feast and really made me feel like a queen of the kitchen. Sometimes, I will not be able to please everyone, but it does not stop me from trying one bit. This was just one of those dinners. We have so many dinners that bring me joy, which is why I must keep on cooking!